The Fuayo Group, one of China’s largest manufacturers of glass for the automotive industry, added in 2014 an additional five RimStar systems with a further nine mixing heads from KraussMaffei for polyurethane encapsulation of vehicle glazing in China. Another system with two mixing heads was the first of several machines to be delivered to the Fuyao plant in Lake Orion, the US. China Fuyao’s customers include global brands such as Volkswagen (VW), General Motors and Ford. “Although the RIM windows encapsulation process is the most expensive process compared with other processes, it is now the industry standard on account of the durability of the polyurethane (PU) seals, the process reliability and the installation advantages of a polyurethane seal compared with bonded rubber seals or thermoplastic injected seals,” Thomas Elfroth, KraussMaffei Technology Manager for Window Encapsulation and responsible for Asian markets, said. PU systems are highly suited for automotive applications because the material is resistant to UV light, is light and yet resilient, has practically no residual and dampens vibrations and sound.. It is suitable for large-scale automation and has short curing times. Engineered as modular systems, the machines in the RimStar Series can be flexibly configured to match application specifications. 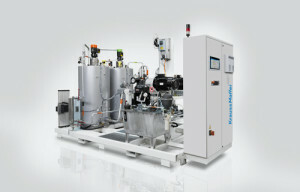 The PU materials can be conditioned, metered and mixed using RimStar machines. The high pressure pumps in the RimStar Series, which were developed and produced in-house by KraussMaffei, also permit exact and reliable metering of different matrix components. Magnetic couplings, volume or mass flow meters, heat balancing systems and sophisticated MSR technology are all part of KraussMaffei’s metering system standard. Mixing heads are the second main component of the RimStar machines. The two normally liquid components of the polyurethane system are mixed in the mixing head. In polyurethane processing one component consists of polyols, catalysts and additives while the second component contains isocyanate. KraussMaffei said it provides short, rheologically optimized line paths between the individual machine components with the result that only minimal pressure losses occur and the temperature can be controlled precisely. The electric mold carriers in the WinCap Series, which were completely revamped in 2013, offers better ergonomics and greater user friendliness because the swiveling mold fixing platens make it easier to remove mold parts and insert substrates. Parallel mold carrier movements and high traveling speeds enable short cycle times and high productivity.